Will Corporate Debt Cause the Next Recession? One thing is certain: A U.S. recession will eventually come along. The question is what will cause it and when. Among the oft-discussed culprits is corporate debt. Bloomberg Opinion columnists Nir Kaissar and Noah Smith recently met online to debate whether companies have accumulated too much debt and if that poses a risk to the economy. Noah Smith: More people are worrying about U.S. nonfinancial corporate debt, which is at an all-time high as a share of the economy. Bloomberg News looked into a bunch of big acquisitions and found that a lot of companies are so leveraged that they would have a junk label if credit raters weren’t being lenient (sound familiar?). The Federal Reserve is starting to watch the leveraged loan market carefully as these loans proliferate. Bank of America is on “recession watch,” modeling losses from a junk-bond crash. Bloomberg Opinion’s own Danielle DiMartino Booth believes that large amounts of so-called investment grade debt isn’t actually very safe, consisting of leveraged loans, junk bonds and BBB-rated bonds. Meanwhile, credit spreads have shrunk to levels that often presage a recession. And the Fed intends to continue raising interest rates. Why shouldn’t we be worried about corporate debt? Nir Kaissar: I don’t see much in companies’ financial statements to be alarmed about. For one thing, they don’t seem excessively levered. The Standard & Poor’s 500 Index represents roughly 80 percent of U.S. public companies by market value. Its debt-to-equity ratio is 113 percent. 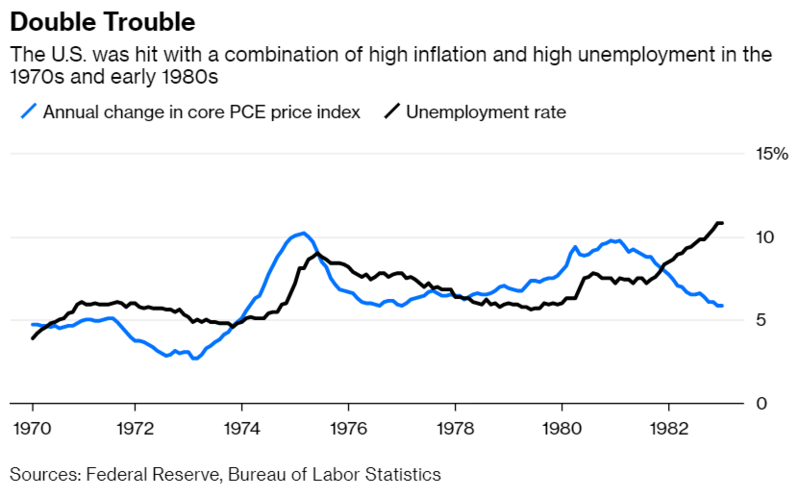 That’s lower than the average of 163 percent since 1990, and half as much as during the past two market peaks in 1999 and 2007. Of course, some of that is related to deleveraging by banks since the 2008 financial crisis. The D/E ratio of the S&P 500 Financials Index is 158 percent, down from 563 percent in 2007 and 585 percent in 1999. But the numbers are no more concerning after excluding the banks. The D/E ratio of the S&P 500 Ex-Financials Index has climbed to a relatively modest 93 percent from 75 percent in 2007 and a post-crisis low of 68 percent in 2010. Those numbers don’t suggest excessive demands on companies’ ability to pay their debts. The S&P 500’s EBIT margin — or earnings before interest and taxes as a percentage of sales — is 13.3 percent, which leaves lots of room for companies to absorb higher interest rates at current leverage levels. Yes, EBIT margins will contract during the next downturn, but interest rates would most likely decline, too. There are things to worry about, but excessive corporate debt doesn’t appear to be one of them. Watch volatility spike, and then watch investors scatter for safety. Only this time, they don’t seem to know where to hide. After years of calm, market turbulence has returned. The annualized daily standard deviation of the S&P 500 Index — a common measure of volatility — has been 18.6 percent from 1928 through March. But the market was much quieter from 2012 through January, with a standard deviation of 12 percent. That quiet ended abruptly in February. 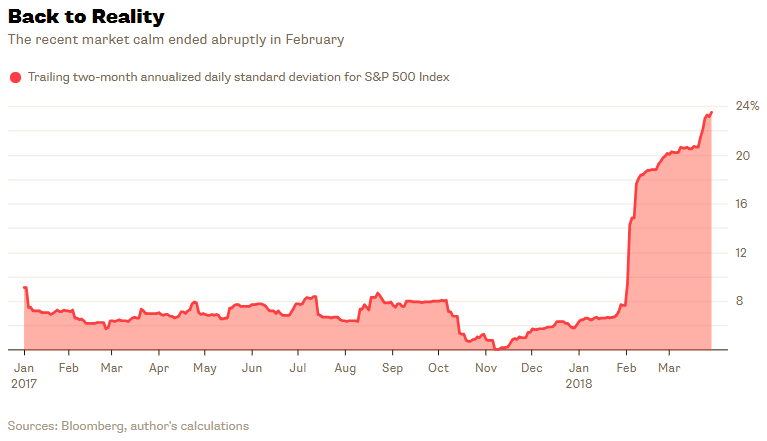 The S&P 500 tumbled 8.5 percent in just five trading days from Feb. 2 to Feb. 8, and its standard deviation has spiked to 23.4 percent since February. 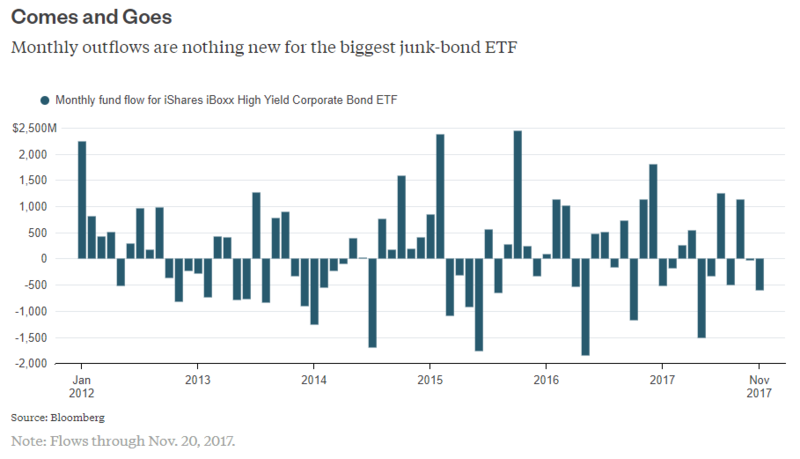 Pimco is gearing up for a junk bond binge — or at least opening the door to that possibility. 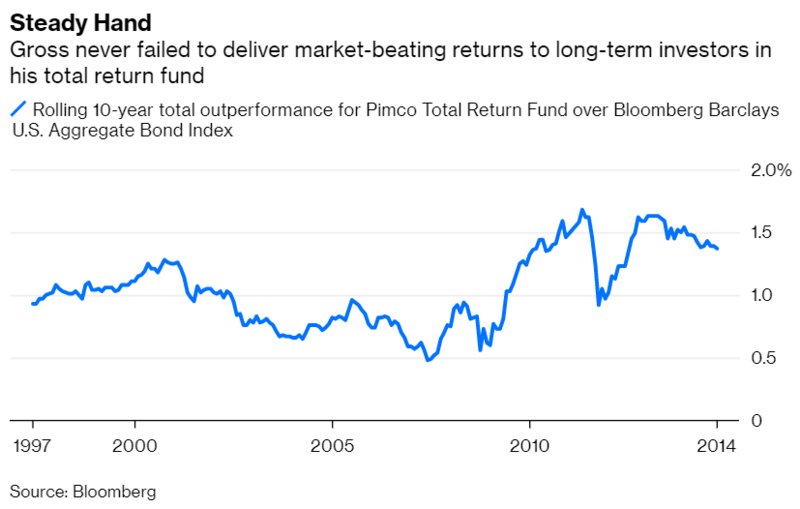 The Pimco Total Return Fund, Pimco’s flagship bond fund, will be permitted to invest up to 20 percent of the Fund in junk bonds beginning on June 13, up from 10 percent currently. The Fund’s current allocation to junk bonds is only 2.5 percent, so the new 20 percent ceiling would be a monster eightfold increase in the Fund’s allocation to junk bonds if fully utilized. A lot of people are worried about corporate leverage. 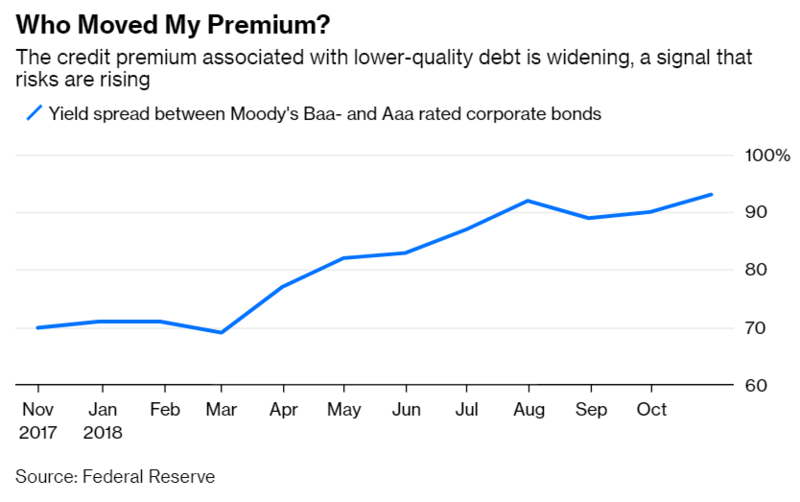 Years of cheap credit have encouraged corporate borrowing, and credit spreads have widened recently on fears of a global slowdown — all of which makes for a potentially explosive cocktail. By one measure — the debt-to-earnings ratio — corporate leverage is at a 12-year high. But other measures of corporate leverage suggest that fears of a corporate debt binge are overdone. According to Bloomberg data, the debt-to-Ebitda, debt-to-equity, and debt-to-assets ratios for the S&P 500 Index are all well below their historical averages since 1990. The U.S. is not alone. All three ratios for the MSCI ACWI ex-USA Index are also well below their historical averages since 1995 (for both the S&P 500 and ACWI ex-USA, the first year for which data is available).